I first came across A Rabbit as King of the Ghosts in a second-hand edition of Wallace Stevens’ selected poems that I bought at university. I do not know much about Stevens. I never studied him and this collection is all I have read of his work. But this poem made such an impression on me. Some of this is personal. I had a rabbit as a child and the vivid descriptions in the poem make me see him – the way his ears would follow you around without having to move his head, whilst those ever-watchful eyes, belonging to an animal designed to look out for predators, were stuck on the side of his head so he could see the world all around him in 360 degrees. The incredible alertness, the ability to take off at a sixpence. His relationship to the world and how different that was to mine. When I was a child I used to play a game – a kind of mental game – where I used to imagine myself into another creature’s experience. I remember once sitting imagining myself as a fly that I was watching. I can still see it to this day against the white of a painted door, picking up its legs and rubbing them up and down in the way flies do. Darting jerkily – nervously – across the paint surface. Those unreadable alien domes of eyes. And I remember the point where the experience switched from just imagining and observing, until it seemed as though I inhabited the consciousness of that creature, look through its eyes, skit about the painted door with those long black fragile legs. And, of course, child as I was, I managed to completely disturb myself thinking about the poor fly, about how we so easily swat them, kill them. How little we consider them. Later, this idea extended into thinking about consciousness. One day, I remember I suddenly became totally aware of all the consciousnesses in the world – all the experiences, senses, thoughts and other awarenesses out there, of all the other human beings in the world: all the animals, all the insects, every single conscious being. The scale of this thought overwhelmed me. I had a sudden sense of infinite space filled by these consciousnesses and the amount of space that all this thought and feeling took up – and, with it, the inevitable awareness of all the suffering too. Perhaps this is a stage all children go through where their minds one day suddenly become aware of all the other minds thinking, feeling and experiencing the world out there. I was left awed and overwhelmed by the scale of it – by the enormity of all those consciousnesses jostling about in the world – and it also left me fearful and upset. It is a mental “game” that I had to be careful not to play too often any more. There are two examples in literature that take me back to this – one is Zaphod Beeblebrox and the Total Perspective Vortex in Douglas Adams’ The Restaurant at the End of the Universe (the Total Perspective Vortex being a unique form of torture designed to blow your mind by showing you just how tiny and insignificant you are in comparison to the vast enormity of the universe – Zaphod came out, ego intact, eating cake)…and A Rabbit as King of the Ghosts. When I first read Stevens’ poem it took me back into that childhood experience. Me, sitting on the lawn in my garden in the sunset, watching my rabbit and opening my mind to another’s consciousness. This is, perhaps, just a deeply personal reaction from me based on a childhood memory. But what the poem does capture so well is that sense of the mind yawning open to the world – the moment where the eternal world and the internal world meet and become vividly alive through that process of imagining. The poem itself, at first glance, is quite simple. The poem is about a rabbit, at dusk, and its awareness of the threat of a cat. I love this idea of “rabbit-light” – of a world where the rabbit grows in power and consciousness. It is a simple poem, easy to read, and yet it captures that sense of a consciousness reaching out and merging with the eternal world – that profoundest of feelings that can wash across us sometimes but are so rarely described in literature. Its relation to my childhood memories make this a special poem for me and so I had not considered it in symbolic terms. 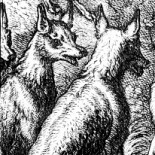 One interpretation I read suggested that the rabbit represents poetry itself – poetry that comes out at night and inhabits that strange half-world that exists between day and night. It is certainly a plausible explanation. But, I’m not totally sure about this. Why would you choose the rabbit as a symbol for poetry – not an obvious choice, surely? It strikes me that the rabbit is a very curious and unusual creature to be at the centre of a poem. Not a particularly glamorous or brave or exotic animal, the rabbit is a humble beast – timid, not venturing far from its burrow, and ever-fearful of predators. Considered now to be one of the great twentieth century American poets, Stevens – like that other great modernist poet, TS Eliot – did not lead the most exciting life. Just as Eliot famously worked as a bank clerk for many years, so Stevens worked in an insurance office. He published his first collection of poetry in his forties and found fame relatively late in life. Staying with the day job until his death, he used to write poetry in the evenings. Much of the charm of this poem lies in the idea of such a modest ordinary creature – the rabbit – becoming so elevated – magnificent, a “king of the ghosts”– and diminishing the normally-powerful cat* through an act of imagining in the dusk of the evening. It is tempting to wonder if, rather than representing poetry, the rabbit might not be Stevens himself. Not the most exciting creature in ordinary life, perhaps – neither glamorous nor a risk-taker as he plods off to the insurance office every morning. Stevens was no Byron or Shelley. But, by night, everything changes and a creature who may be timid and ordinary by day becomes a king of the dusk – through the power of imagination and consciousness and by opening his mind to that other, powerful way of thinking that merges his consciousness with the rest of the natural world, through the act of writing poetry. I like the idea that this poem – a poem I find deeply charming for the vivid imagery that so perfectly captures the physicality of a creature I used to know as a child; that moves me through its evocation of a childhood “game” I used to play – could also contain a warmth and humanity and playfulness in its view of the ordinariness of adult life and the transformative power of art and imagination on that life. A humble poem, that may not look like it is about much at first glance, A Rabbit as King of the Ghosts shows that the humblest soul can touch infinity through an act of imagining. Even if you are just a rabbit. To find out more about RosyB click here. A fine poem by an amazing poet- very fine interpretation too. Rabbits are fascinating creatures and people can seem like rabbits- I’m thinking in particular of the Rabbit character in Updike’s series of novels (an anxious Everyman who has an ordinary career)- but this poetry is so succinct it not only blows your mind but also makes it hard to work out precise meanings which is of course part of its beauty. Wow, what a splendid essay! That was just terrific! The way you put memories, symbols & philosophy altogether like that, making it almost a Zen moment was lovely & so well done. I don’t know if I’ve ever read any of Steven’s poetry, but I definitely must rectify that, I really like the quotes in the post. 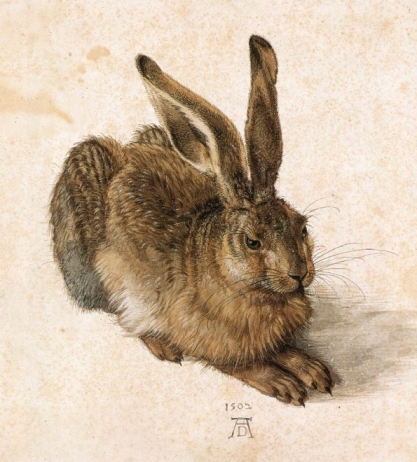 And that is my very favorite Durer painting, which is a perfect accompaniment to the piece. Really lovely piece, Rosy. Splendid poem. I can see why you were so taken with it. Seems to touch on something mystical almost. Enjoyed the theories about the poem’s meaning, but most of all I enjoyed your description of your childhood self beginning to comprehend the vastness of the world. Thanks everyone! Very pleased people enjoyed it. It’s a lovely poem. John – I agree about the difficulty of working out precise meanings and I think that Stevens said something like (I can’t quote it exactly) that poetry should resist the intelligence almost successfully. If we could totally nail the meaning in a one-line way, the poem would not be a poem, it would be a crossword. The fact these few lines can send us scurrying around in our minds and yet never quite able to nail it down, not to mention the emotional and aural resonances, is what makes a poem a poem and more than a crossword. Jackie – I love this picture too. One of my very favourites. He did a lovely clump of grass too! Cheers Beatles Fanatic and Lisa. It is an inspiring theme and nice to have done a poem that wasn’t quite as miserable as some of the others I’ve written about for VL. Makes a change. I remember you always had that picture in your room too…have you still got it? Think it was one I found in Oxfam. Lovely piece, Rosy. Mmmm! lovely poem, and thankyou for introducing me to it. I’m a fan of Zaphod, by the way – I’ve always thought he’s the best sort of galactic President. That massive, impregnable ego, combined with amorality, essential good humour and general laid-back-ness – made for the job. Thank you for tempting me to look at Wallace Stevens’s poetry – this poem sounds like something truly original and piquant. I knew the name but have never been tempted to look at his work – I fear it may be because I’ve subconsciously discounted his rather mundane name … oh dear! Anyhow, this is a fabulous post that gave me so much to think about, from beginning to end – thank you! a very fine evocation of Stevens’ poem but I have one suggestion for those who would look at him and his work in more detail: describing him as having worked in an insurance office is akin to saying Napoleon saw military service. Stevens rose to very high up in one of America’s largest and finest insurance companies. The contrast between being a corporate exec of high rank and a poet of such sensitivity has been a wonder to me for forty years. I still have trouble with it. But I don’t know that sensitivity can’t be found in a high ranking corporate exec. Leonardo Da Vinci was a military engineer designing weapons, after all. Didn’t Kafka also work in an insurance office? I had never come across Stevens’ work, and am now intrigued — I will have to read some, starting with this! Jackie, yes, Kafka did. He used to write reports of workplace accidents with gruesome illustrations. Read Paul Mariani’s Bio. Stevens had an amazing life. Quite adventurous. Know any other writers who had a street fight with Hemingway? Stevens 55 Hemingway in his 30s. He traveled America by train doing his boring Insurance Work. Find Bill Murray reading of this poem; Like Oreos and Milk. 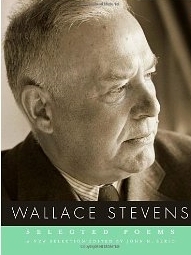 This entry was posted on May 18, 2011 by rosyb in Entries by Rosy, Poetry, Poetry Week, Poetry: 20th Century and tagged American poetry, poetry and imagination, Wallace Stevens.